An environmentally friendly stern tube system! Seawater lubricated bearings With condition monitoring system. In drydock and need a new rudder bearing? We offer market leading delivery time! Norden 788 Marine tubes are kept in stock, and ready for final machining. Norden's fast-lane ensures non-stock items are delivered with market leading delivery time. Pilot boat LOS 113 is manoeuvring pilots every day, supported by Norden rudder bearings. Dredging operations require tough and wear resistant bearings to support used equipment. Norden Marine Bearings is a unique supplier for dredger operators and newbuild yards, since our portefolio includes both composite and elastomeric materials. The bearings are today in use on many dredgers, and ensures operational uptime in harsh working conditions. Hatch cover pads are an important component that, together with the seal, ensure a water-tight hatch cover. Many operators are required to do frequent pad replacements due to high wear rate of commonly used pad materials. Norden Hatch cover pads offer an alternative, and are a proven cost effective pad with low wear rate and long service life. Norden's material portfolio consist of two main types of synthetic materials. 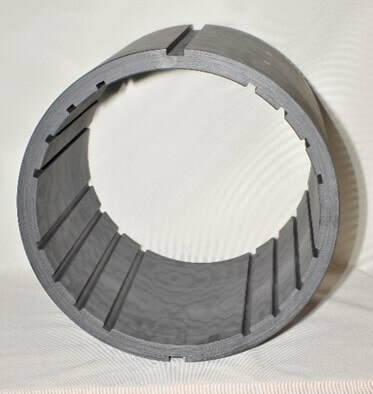 Our composites have high load carrying capability and excellent friction properties. Our elastomeric materials have very good shock absorption properties and abrasive resistance. Our wide range of materials enable us to give objective performance based advice to our customers.